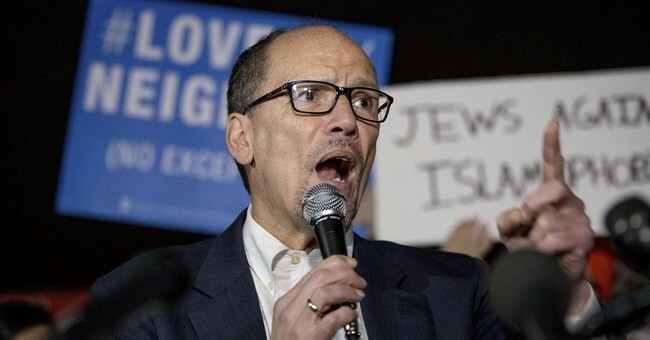 State Democrats’ three-day convention had a raucous start Friday, as liberal activists booed and heckled Democratic National Committee Chair Tom Perez after marching from the state Capitol to promote a universal heath care program. The leader of the nurses’ union that opposed Perez’s recent election had just warned California Democrats that they would put up primary election challengers against lawmakers if they don’t support a bill to create public-funded, universal healthcare. “They cannot be in denial anymore that this is a movement that can primary them,” RoseAnn DeMoro, executive director of the California Nurses Association, told hundreds of nurses and health care advocates gathered for a rally at the Capitol. “Vote them out,” the crowd chanted back, referring to Democrats in the Legislature wavering on whether to support their cause. Delegates to the state Democratic Party convention in Sacramento chose Mr. Bauman as a successor to departing Chairman John Burton, who has been credited with helping solidify the party’s control of the state, even at a time when much of the rest of country has been awash in a sea of red. Supporters of Mr. Sanders had backed Kimberly Ellis, who had promised to reorder the party establishment and redefine what it means to be a Democrat in this deeply blue state. Mr. Bauman received 1,493 votes while Ms. Ellis got 1,431. A third candidate, Lenore Albert-Sheridan, received seven. Ellis said late Saturday her team has "serious concerns about the vote count" and has talked with a lawyer. She says "this race is not over." Ellis did not say what made her question the vote count. She lost by 62 votes out of nearly 3,000 cast to longtime party insider Eric Bauman. The result was a letdown for Ellis supporters who'd been energized by inaccurate reports on social media that she had won the race. UPDATE: Over at Hot Air, Ed noted that Burton concluded his speech at the convention saying “f**k Donald Trump” while throwing up both middle fingers. What a clown show. He also noted that House Minority Leader Nancy Pelosi (D-CA) was on that stage.